Our party of ten was represented by the Clean Tech and Smart City incubator, Eighteen04, and the trip was organised by one of its residents, Dr Andrew Mears of SwitchDin. Our tour guides and experts on the ground in Hong Kong and China were the exceptional team from Brinc.io. To enter China for commercial and trade purposes we needed an "M visa". China has a long list of different visa categories, but they all seem to boil down to much the same requirements and identical costs. The requirements are laid out well on the China Embassy website. Supplying your passport and passport copy is pretty standard, but the additional photograph has some pretty strict requirements on size and framing. Not many places will guarantee compliance, but I took a punt at a 24-hour self-serve kiosk at K-Mart and got through, despite the friendly assistant's doubts. Given the cost and time constraints of getting passport photos done on short notice, discovering the 24-hour K-Mart kiosk was a big win. The application form is long and ugly, and takes quite a bit of cooperation from your hosts in China. They must provide an invitation letter and details such as the itinerary must match. It's not possible to be ignorant of the Chinese details of your trip! Six and twelve month visas are not available to first timers so we opted for double entry for $140. Proving that analog is not dead in the Middle Kingdom, the "Chinese Visa Application Service Center" that processes the application sticks the visa itself to a page in your passport. It's valid for six months and allows 60 day stays for each entry. Our home base for the China trip was Hong Kong Island, Hong Kong. "Central", the CBD on Hong Kong Island, is a 30 minute ride on the MTR express train from Hong Kong International Airport. The trip costs 100 Hong Kong Dollars, or about $20 Australian, and WiFi is provided on board. The initial Hong Kong experience is relatively familiar for Western travellers, with lots of spoken and written English and a civilised system of trains and tickets. Apart from the TVs blaring Cantonese ads on the train, the most striking feature of Hong Kong on first arrival was the elaborate construction activity. Low-lying artificial islands, visible on approach to the airport, littered the seascape. Enormous concrete span bridges, mostly incomplete, wound their way around the islands as if they were coaxing vehicles into the developing regions. The cargo handling facilities at ports stretched on for acres, well equipped for staggering levels of trade. And the feature that was to become iconic of my Hong Kong experience - towering apartment skyscrapers that erupted from the landscape, surrounded only by other identical apartment skyscrapers. My hotel was not far from Central station so I took the opportunity to wander my way there, zigzagging across the city as sights took my interest and my bearings retuned. Not far from the station I came across a large group of people, comfortably occupying the footpaths as if they were at home. 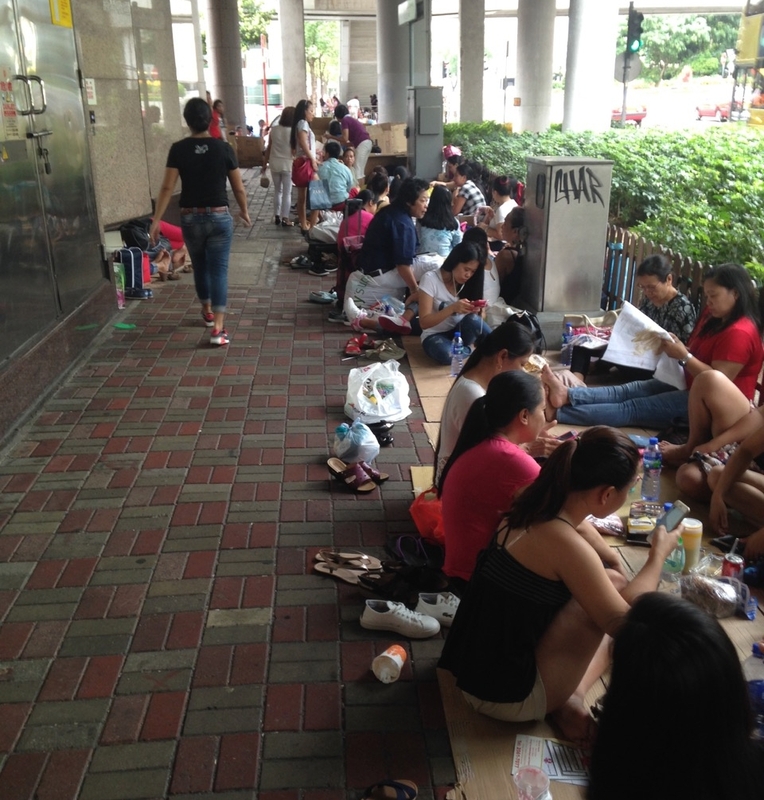 They were playing cards, combing their hair and painting their toenails, sitting on cardboard sheets that formed a continuous area along the path. Having passed through Sydney Central Station earlier that day, the sight of homeless populations congregating around transport hubs was familiar. But this was different. The group seemed quite social and had all sorts of personal effects with them from phones to make-up kits. Puzzled, I snapped a photo and turned the corner. To my surprise, the congregation I had photographed was a tiny fraction of the phenomena. Along the next street the cardboard village stretched as far as the eye could see. There was food and drink, chatter and reading, elaborate string and cardboard constructions and even a few tents. The inhabitants were adult aged, of Asian appearance, and - it finally dawned on me - all women. It occurred to me briefly that I might have stumbled upon the line up of fans to some Asian heartthrob sensation, but it was a weak theory. I discovered later that they are all foreign (mostly Filipino) domestic workers, aka "helpers", who work as live-in maids 6 days a week. On their statutory Sunday off, they congregate to get away from the isolation of living in their employer's homes. Many are educated professionals, but can earn three times as much as a maid in Hong Kong than as a professional in the Phillipines. It's quite staggering to think of the social consequences of disparate economies amongst geographic neighbours. Hong Kong Island is hilly. There's even an elevated escalator that runs right through the center of the CBD to ferry pedestrians from the low-lying areas. The streets are narrow and the footpaths jut this way and that, which make the towering apartment blocks even more imposing. The climate is either hot and humid or very hot and very humid, and the city seems to run on constant A/C. The shopfronts are hard up against the footpaths and the apartments hang overhead, so navigating the streets is a sweaty affair with alternating bouts of cold A/C blasting out of a shopfront onto the footpath, or wet A/C condensation dripping on to your head. Despite this incredible density, traffic flows smoothly and the city is highly walkable. Clearly here the car is not king, and a system of subways, alleys and escalators keeps people moving. For keeping in contact, navigating the city and discovering points of interest, there really is no substitute to having the Internet on a mobile device. The WiFi in the hotel was good, albeit intermittent, and while there was an above average smattering of public WiFi hotspots, they are really too unreliable, insecure and intermittent to justify the frustration of using them. Surprisingly, there was a large smartphone sitting in a cradle in my hotel room, lit up with a rich animation enticing me to take the phone everywhere I go. At first I was very sceptical about such a generous hotel inclusion, but came to really appreciate having an unlimited data, unlimited local call mobile during my stay. Not having to lurch from hotspot to hotspot, or buy and activate a foreign SIM, gave a great deal of freedom to explore without fear of becoming stranded. Now I'd really miss this feature if I were to travel to another foreign hotel. The phone ran an Android based OS called Handy, bundled with a bunch of tours and deals type app, but also familiar apps like Chrome, WeChat, Facebook and Google Maps. There was even a function to secure wipe all your locally stored personal data that apparently would run automatically at the end of my stay. On the other hand the bundled guide apps were comically useless - I scrolled through looking for some dinner suggestions and found this gem, captioned with "The signature disk toast with scrambled egg is a must-have! The scrambled egg is made with fresh cream and sugar, which gives a creamy texture and strong milky taste". TripAdvisor probably doesn't need to worry about being displaced just yet. Speaking of restaurants, Hong Kong's night time district is packed with bars and eateries. From eclectic hole-in-the-walls to underground beer halls and from Chinese to Lebanese cuisine, you didn't have to go far for a new experience. However, at an average price of about $14 for a beer and $30 for an entree, the Australian dollar didn't go far either. After an evening to acclimatise, we all gathered for the first time at Brinc headquarters on the top floor of the old Police Marital Quarters (PMQ) in Central Hong Kong. We were grouped in a WeChat channel and this quickly became the primary method of organisation - everything from contact exchange to itinerary updates to restaurant map links and location sharing was handled within WeChat. In many parts of China WeChat is even the primary method of paying, but where we travelled cash was king. We met a few members of the Brinc team, including the incredibly animated @BetaBay, as well as a resident of their accelerator, Antoine Markarian, CEO of Kello. We learnt Brinc's primary business was their accelerator, which involves a shortlisting pre-accelerator, and then a very hands-on intensive 12 weeks to get their cohort to market. Although Brinc was passionate about all aspects of the Internet of Things (IoT), their speciality was high volume consumer goods. Despite having Silicon Valley origins, their base in Hong Kong made a great deal of sense - time and time again they had seen founders hit a wall when it came to manufacturing - struggling to effectively cost, forecast, quality control and protect their inventions through the production process. Shenzhen in China is the undisputed world powerhouse when it comes to mass manufacture of electronic goods, but for a foreigner, operating within China is very challenging. The laws, customs, language and culture all provide complications for what is already a difficult time for a founder. Hong Kong has very effective trade logistics both with China and with the rest of the world, and has done an excellent job of positioning itself as the interface between Shenzhen and the Western business world. Our primary contact at Brinc was Edwin Lee, who went above and beyond to ensure our travel experience was trouble free. From money exchange to organising translations to recommending restaurants to purchasing train tickets, Edwin was a very friendly, very attentive tour guide, host and all round good guy. Despite our best efforts at getting lost, Edwin managed to shepherd us all intact, from Hong Kong to China and back again. Tune in for part 2, where we travel just 30km from Hong Kong Central, and enter a whole new world in China.